Karle Pittsinger won a state title in the shot put at Chelan High, then picked a college sport she had never tried. Now she is team captain for the national champions. After years of starring in the discus and shot put at Chelan High School, she was invited to walk on to the Washington track and field team. That was her plan for years. But her gut was telling her something different, and she listened. She would walk on to the rowing team instead. Rowing was a sport she had never tried, although a family friend had rowed for the UW women in the 1980s. Pittsinger’s decision left some confused, and her father a bit sad, but it all worked out. Pittsinger, a senior majoring in philosophy, is the team captain for the defending national champions, who will try to defend their Pac-12 title Sunday at Gold River, Calif.
She has not once regretted changing sports. Her father, Bret, was the throwing coach for the Chelan High School track and field team and had instructed his daughter for years. Karle said that, although her dad’s main desire is for her to be happy, he had mixed feelings about her choice. The Husky crews are always on the lookout for talent, even people like Pittsinger who have little or no experience in a boat. Pittsinger tried rowing for the first time in the summer before leaving for UW, taking a single scull out on Lake Chelan. But she was a quick study at UW, finding great joy and even great comfort during a time when she really needed it. Two weeks after she started at UW, her brother Matt was in a bad skateboarding accident that left him in a coma for six months. Karle’s parents talked her into staying in school, and she found solace on the water. “I found so much peace in rowing because it took me away from what was happening with my brother’s injury,” she said. Matt is now doing great, but the experience changed Karle’s perspective. She still wears a bracelet her parents gave her during that tough time. After rowing on the varsity-eight boat in the NCAA championships as a sophomore, she was moved down to the second varsity boat at midseason last year. 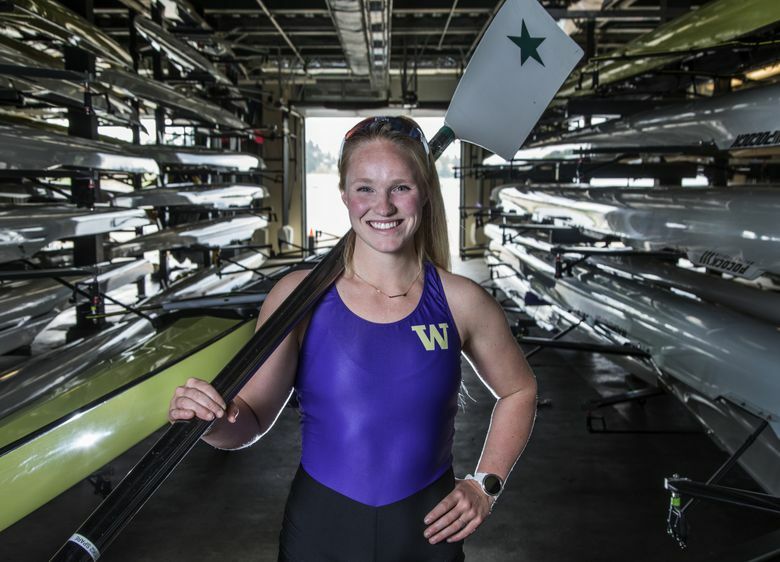 She didn’t get discouraged, continued to work and helped that boat win its race at the NCAA championships, part of UW’s historic sweep of the varsity eight, second varsity eight and the four. It’s that type of attitude that got her voted team captain. There were four nominees, and each gave a speech before the voting. Pittsinger is quiet by nature, but has become more vocal in her leadership role. Despite the demands of rowing, Pittsinger is the CEO of She Will Win, a company she started as part of a UW class. It sells apparel aimed at bringing awareness to women athletes. This past summer, she was the distributor for Bad Granny Cider, a hard cider made at the winery owned by her family. For now, it’s mostly about rowing. In a couple of months, she will begin training with the U.S. rowing team in Princeton, N.J., but she is single-minded about finishing her senior season the right way. “Part of why I think I was selected to be captain is my quiet work ethic,” she said. “I love nothing more than the work when no one is looking, but I think I’ve been challenged to become more vocal.